Kirkwood City Hall is located at 139 South Kirkwood Road, Kirkwood MO 63122; phone: 314-822-5804. Photo: James H. and Marietta Comfort House, ca. 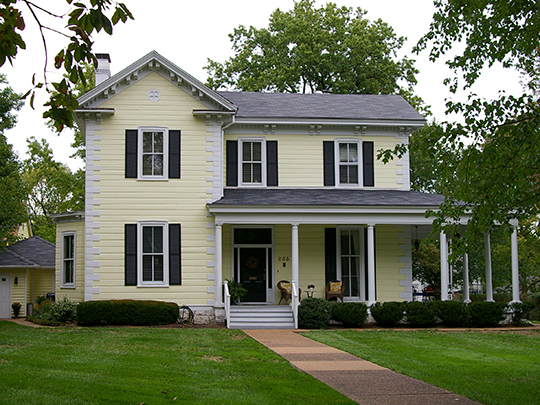 1871, 235 East Jefferson Avenue, Kirkwood, MO. Listed on the National Register of Historic Places in 2002. Photographed by user:	CAnderson (own work), 2012, [cc-by-3.0 (creativecommons.org/licenses/by/3.0)], via Wikimedia Commons, accessed May, 2014. Kirkwood is located in south-central St. Louis County, near the City of St. Louis. It is one of the larger suburbs of St. Louis, covering roughly 57,000 acres and hosting a population of about 28,000. The commercial and governmental center, which is in the oldest part of the community, is located around the intersection of Kirkwood Road and the railroad right-of-way now utilized by Amtrak. The commercial center and the adjacent neighborhoods contain a large concentration of historic resources; more recent suburban development can be found in the outlying parts of the community. Although by today's standards, Kirkwood is relatively close to the city, it was a distant satellite community when it was created in the mid-1850s. Kirkwood has the distinction of being the first planned railroad suburb in Missouri, and may have been the first such development anywhere west of the Mississippi. The original town of Kirkwood was developed to take advantage of the establishment of Missouri's first railroad corridor. It was designed to serve city dwellers who wished to live in the country and commute to the City via the new train system. Kirkwood was envisioned by its creators as a largely residential community, and it remained so for much of its early history. As a result, a large majority of the historic resources found there are residences. In 1853, the first passenger train of the brand new Pacific Railroad Line ran from its point of origin, St. Louis, to Kirkwood. The beginnings of Kirkwood can be traced to a meeting of St. Louis businessmen which took place two years earlier, in January of 1851. It was at that meeting that the group officially formed the Kirkwood Association, which had the stated purpose of purchasing a tract of land "on the Pacific Railroad, for the location and improvement of a villa, within suitable distance of the City of St. Louis." The Pacific Railroad continued to be the only mass-transit option for City-bound commuters throughout this period. Activities of the Kirkwood Association dominated area development from 1851 until the early 1860s, and the physical layout of the original Town of Kirkwood, with broad tree-lined avenues, and a grid pattern of streets, is still a defining characteristic of the survey area today. The dwellings which survive from this period range from modest vernacular houses to large styled residences; many of the more elaborate dwellings originally occupied generous tracts of land. By 1865, the town was well established, and on February 20th of that year, the Missouri legislature chartered the Town of Kirkwood, at the request of its residents. Having platted all of the land it had purchased for the creation of the community, the Kirkwood Association disbanded. The railroad continued to be the most common form of transportation to the city, and a public streetcar line was also established during this period. Residential development during this period was extensive, and city leaders continued to promote residential uses over commercial or industrial endeavors. Patterns of residential development generally took one of two forms. Some of the large original lots laid out by the Kirkwood Association were developed for the first time, with large homes surrounded by generous lawns. In other cases, those early large lots were subdivided to make way for more concentrated development. Houses built during this period generally utilized nationally dominant styles. Most of those new houses were large, high-style examples, although more modest dwellings were also built, especially during the later part of the century. In 1899 Kirkwood voters choose to take advantage of revised state statutes which allowed them to have the city reclassified as a 4th Class City. The new century also saw the establishment of public utilities and other municipal services, and a vast expansion in area transportation systems. A second streetcar line was authorized in 1897, and the automobile gradually replaced the railroad as the favored means of transportation. Although the community retained its residential focus, this period saw an increase in commercial growth as well, with an emphasis on retail and service oriented establishments rather than industry. Subdivision of those large original lots continued, often in areas which had seen no significant development to date. Most of the residential development during this period was in the form of homogenous subdivisions which were characterized by evenly sized lots, uniform set backs, and groups of houses of very similar sizes and styles. Some new development also occurred in areas which were largely built up, and several blocks within the survey area today contain lots and houses of varying sizes, along with collections of residential styles and types which offer a representative cross section of the community's long history of development. Most new dwellings reflected national housing trends; high style houses, especially after the 1920s, were much less common. City of Kirkwood Department of Planning and Development, Historic Resources of Kirkwood, Missouri, nomination document, 2002, National Park Service, National Register of Historic Places, Washington, D.C.